Enterprises want it all -- security, reliability, low latency, and resiliency. Kansas City Power & Light (KCP&L) has selected Nokia to enhance its microwave communications network to support mission-critical services for the utility's power transmission and distribution grid. The packet microwave technology is intended to support power delivery and reliability for KCP&L's 800,000 plus customers. Using Nokia's Wavence microwave packet radio technology, KCP&L will simplify network management and operation. In particular, it's using features designed to address the unique needs of utilities, easing their transition from time division multiplexing (TDM) technology to IP-based networks. Nokia developed Wavence with utilities' stringent security, reliability, latency, and resiliency requirements in mind. Herein is where specific and unique concerns of any network surface. Network managers and administrators must delve into the details of any solution to ensure the best fit. Teleprotection systems are typically installed in high-voltage transmission grids and play a critical role in preventing instability in the grid and damage to expensive substation equipment. Teleprotection systems monitor conditions on transmission lines and coordinate tripping of the transmission lines to quickly isolate faults. A teleprotection system usually has two components: a protection relay, which executes the actual switching; and teleprotection equipment, which is the interface to the mission-critical communications network. Teleprotection systems rely on the communications network for real-time exchange of status information and commands between teleprotection equipment. To ensure that the power systems are properly protected, the teleprotection messages must be reliably transferred with tightly-controlled latency. The challenge for many utilities is that digital microwave radios with only a TDM architecture are approaching end of life; that means they need to deploy packet-based systems. 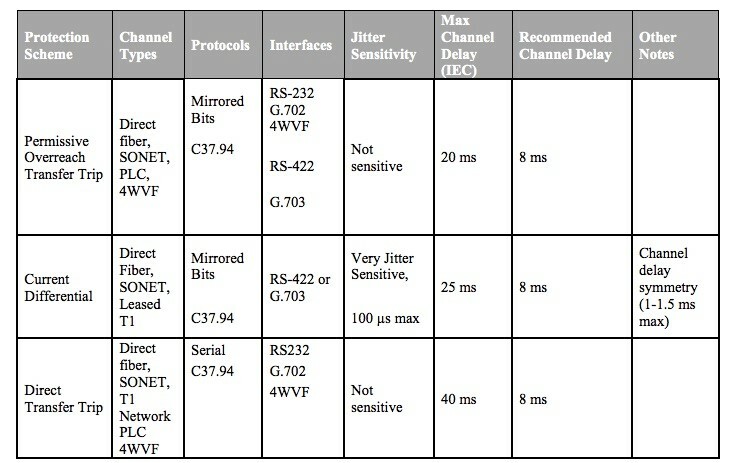 As shown below, the method of protection may or may not be latency-sensitive and may or may not be acceptable over different transports (direct fiber, Sonet, leased T1, etc). Nokia's engineering report provides eight different Ethernet flows, provisioned on a per-VLAN basis between gigabit Ethernet ports on the radios on each side of the system. 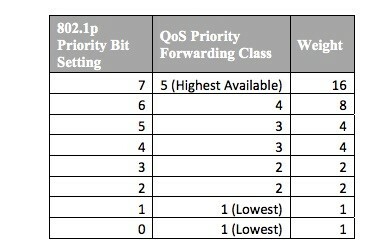 It maps the Ethernet traffic based on the 802.1p bit classification, and assigns traffic to the forwarding classes shown below. This is another consideration for network administrators; they must carefully map their traffic. The details demand attention in both meeting the demands and understanding the transport along with the behaviors of the system being supported. QoS and traffic prioritization will remain key for other applications besides voice and video. Numerous municipalities are providing key services in their regions share growing concerns of how to migrate both telemetering and teleprotection to IP solutions. IoT growth will put pressure on network managers to understand their industry-specific applications -- and this means a meeting of the minds of all concerned.